The New Moon is June 23rd at 3 degrees Cancer. This is the cycle of Cancer, about home, family, and nurturing, not only for others, but for ourselves. The New Moon occurs just a few days after the solstice, June 20th, a major turning point in the wheel of the year. This New Moon is extra powerful for initiating new beginnings that honor our deepest needs and true selves. 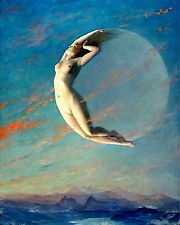 The Moon-ruled Cancer is the sign associated with the Great Mother, the giver of all life. At the Cancer New Moon, we can draw on this life-giving power to rebirth ourselves and the world we want to create. Cancer is a cardinal water sign, guiding us into the realm of our feelings and deep inner world, the place where creation begins. To change what’s manifesting in our lives, we have to start at the level of our subconscious, which is far more powerful than our conscious minds, and is programmed in our earliest years, starting in the womb. The New Moon closely conjoins Mercury, helping us to access the messages from our subconscious, so we can become aware of what we’re creating from the inside out. The warrior Mars entered Cancer June 4th (till July 20th), and is crossed by the Moon the next day. While Mars is in Cancer, we’re protective, when it comes to feeling that our territory has been invaded. It’s also not a good time to ‘kid’ or tease people, as we’re more sensitive. Mars squares Jupiter in Libra (14 degrees) on the 24th, which could put some of us into a corner, forcing action we may or may not want. But overconfidence and enormous drive could result in doing too much too soon. Timing is everything, as they say. Trying to fight against what isn’t in our control wastes valuable energy. The more we push, the stronger we’re repelled. Boundaries will likely be tested on July 2nd. The Moon has moved into relationship-oriented Libra and into the challenging first quarter square, the time in the cycle when changes are made, or forced on us. Mars opposes Pluto (18 degrees Capricorn) also on this day, so, any issues that have been building are likely to erupt around this time. On the plus side, we have the power to go after our goals now with furious passion.